Since I don't get back from Michigan until very late on Friday I will not be doing a blog entry next week. I am taking my camera and will try to take some photos. I've been putting the final touches on the finishing course. I remembered I needed to knit the homework to demonstrate techniques as well as have finished samples to pass around. As with everything, it takes more work than you would think! Stephanie who is attending the retreat came over took one look at the swatches and commented that she was glad she's not taking my class! The students don't need this many...I need ones to show the final product. I received a few lessons to review this week. 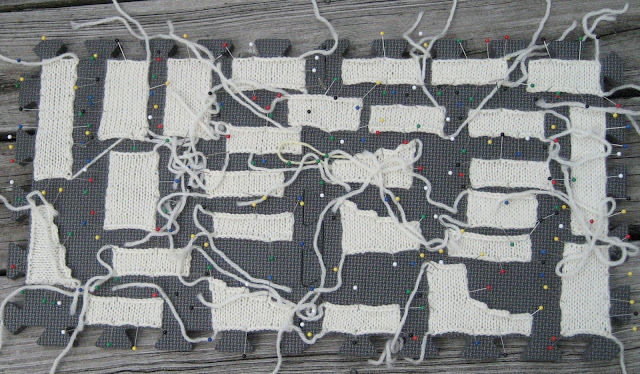 One of the students I inherited for the Swatch to Sweater class sent in her first assignment. I think I will enjoy teaching this class very much. The design is very interesting. I can't wait to see the final sweater. Where do you use mirrored increases? The most common use is on sleeves which are knit from the cuff up. 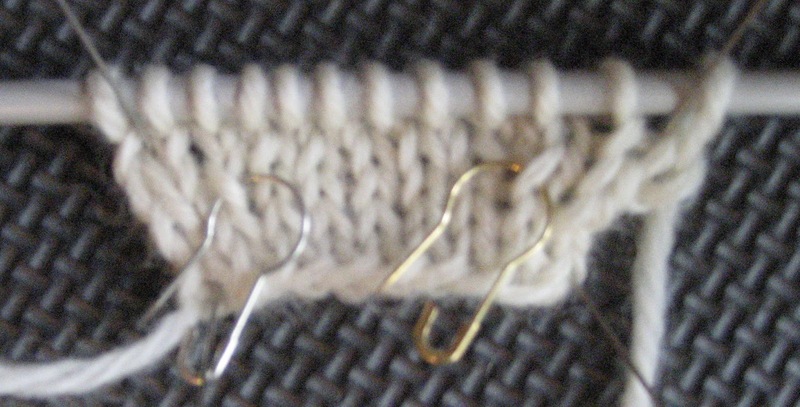 You can also use them to shape necklines on sweaters knit from the top down. Lifted increases are generally considered to be the most invisible when they are properly worked. Unlike M1 increases, they do not leave a hole. 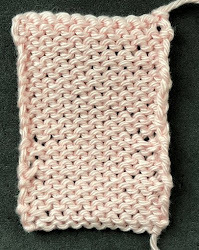 In this example, there are two stitches before the increases on the right and there are two stitches after the increases on the left. Notice that those column of stitches slant to the right and left and the new stitches slant towards the center. Several of my students have asked why the right slanting has that name since the increase seems to slant to the left. The increases get their names from the direction the leg of the stitch used to make the increase slants. This elongates the leg. The right slanting increase is the easiest to work. The left slanting can be tricky. To make the right slanting increase, work the stitches you want before the increase. I recommend at least two. This makes finishing the edge much easier. Either lift the right leg of the stitch below the stitch on the needle or insert the needle into the purl bump at the back of the stitch on the needle and knit a new stitch. 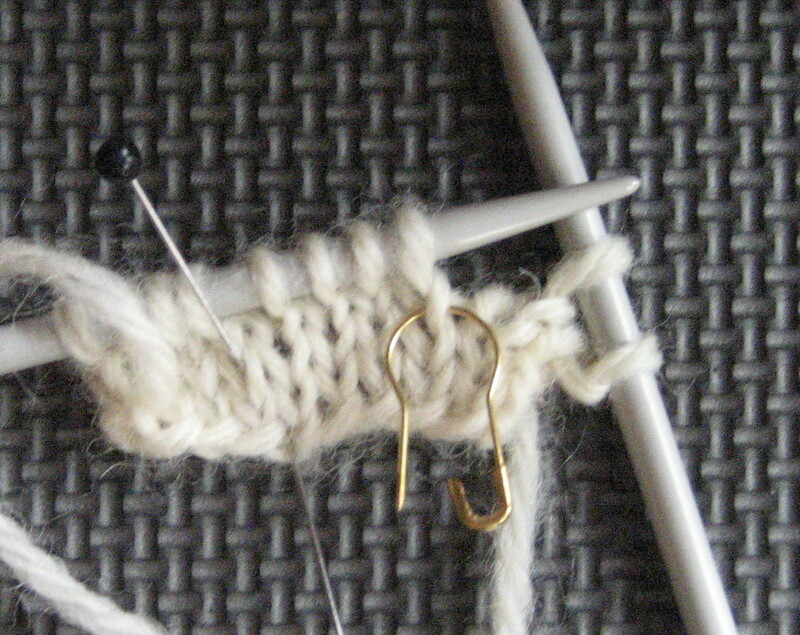 Then knit the stitch on the needle. It is very difficult to describe in words how to make these increase. I suggest watching the video as well. The gold pin marks the leg of the stitch you use for the right slanting increase. 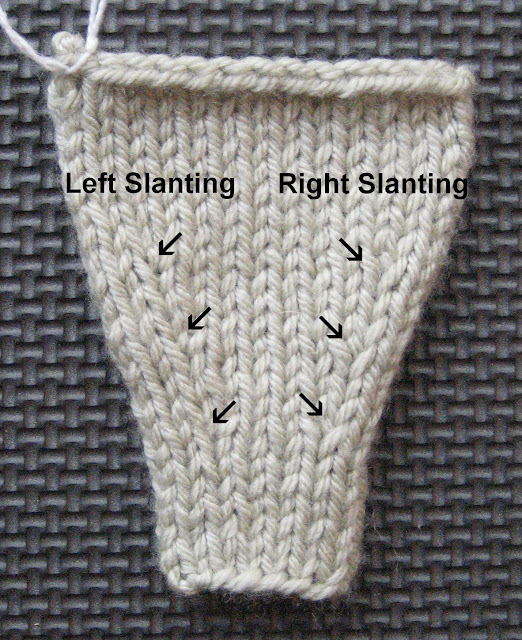 The left slanting increase is much more difficult since you use the leg on the left side of the stitch. The first problem is deciding where to place it. If you have two stitches before the increase on the right, you need two stitches on the left. You use the left leg of the stitch. You can't get to that leg unless the stitch itself is knit first. That means you have to think about making the increase when there are three stitches on the needle. Also you can't use the leg of the stitch below the needle for the left side. You have to go down a row. Try to use the leg of the stitch immediately below and you will see what I mean. It just doesn't work. 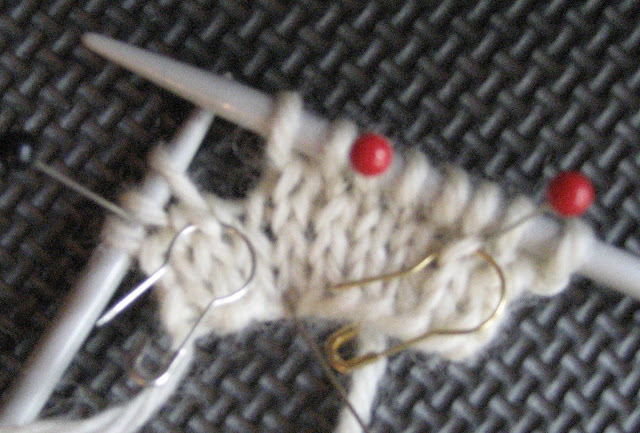 The silver pin marks the leg of the stitch you will use for the increase. Until you get the hang of this, you might want to mark it like this. It makes it easier to see when the stitch is knit. 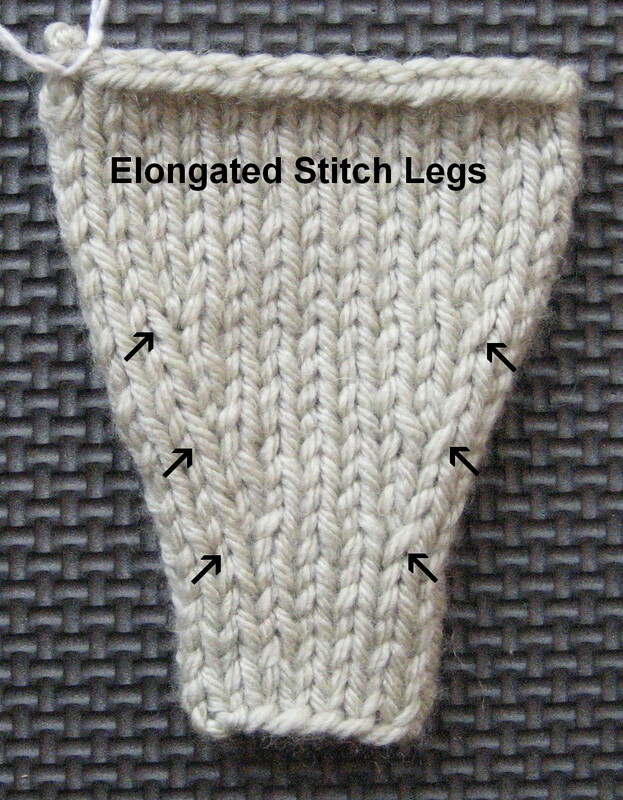 Notice that the legs of the stitches you used are elongated and slant either to the right or left. The best suggestion I can give you for seeing if the increase "match" is to stand back a few feet and look at it. Sometimes you just can't see problems when you are looking too closely. Salon will be on Sunday from 2-5. For those of you not in Kentucky you may not know that this is Derby Week. I remember when we first moved here, people were amazed to find out that the rest of the country does not celebrate Derby Week. I wouldn't dream of scheduling anything other than a Derby party for the first Saturday in May. 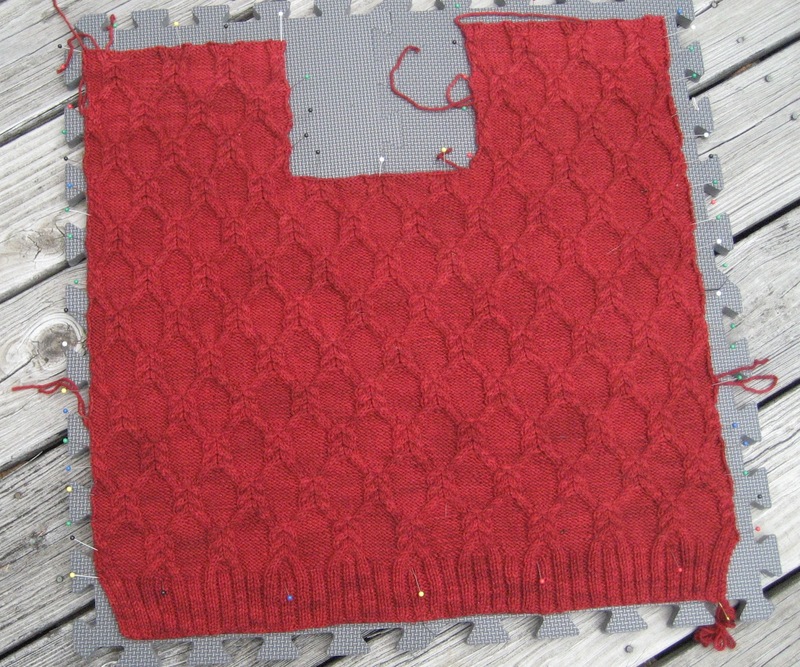 I'm plodding along with the cabled sweater. The back is finished and the front is blocking. It has a square neck which will be finished with a shawl collar. I am still debating if I will have the pattern include sizes for men as well. If I have time, I will. I've got a couple of inches of the sleeves finished.